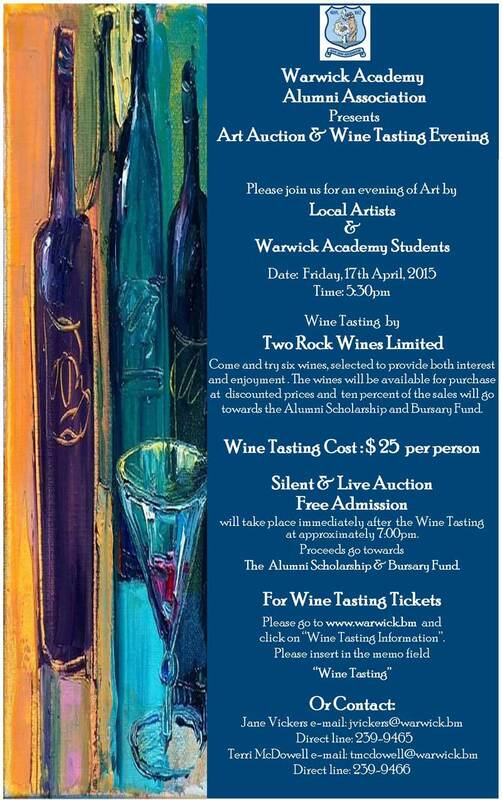 The Warwick Academy Alumni Association is getting set to present their Art Auction and Wine Tasting Evening on April 17, beginning at 5.30pm. The event flyer says, “Please join us for an evening of art by local artists and Warwick Academy students on Friday, 17th April, 2015 from 5:30pm. Wine Tasting by Two Rock Wines Limited. “Come and try six wines, selected to provide both interest and enjoyment. The wines will be available for purchase at discounted prices and ten percent of the sales will go towards the Alumni Scholarship and Bursary Fund. Tickets to the event cost $25 per person and are available online or by contacting Jane Vickers at jvickers@warwick.bm or on 239-9465, or Terri McDowell at tmcdowell@warwick.bm or on 239-9465.